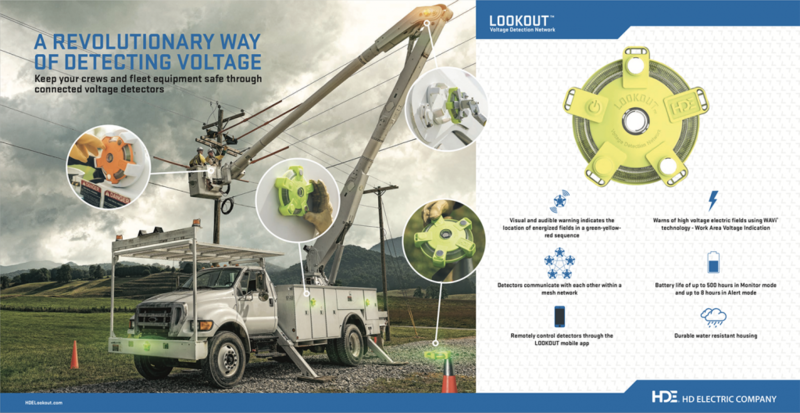 LOOKOUT Voltage Detection Network: A Revolutionary Way of Detecting Voltage « Gresco Utility Supply Inc.
One of the latest innovations from HD Electric Company is the LOOKOUT, a voltage detection network that’s designed to protect both the crew and the fleet. The LOOKOUT detects strong electric fields surrounding high-voltage conductors and fleet equipment and alerts users to nearby dangerous energized conductors before an incident can occur. The LOOKOUT Detectors use WAVi®Work Area Voltage Indication technology. When a strong electric field is detected, a loud alarm alerts the operator and the crew. HD Electric Company states that the detectors can be attached—using strong magnets or available accessories—to bucket trucks, digger derricks, pulling and tensioning equipment, drilling equipment, as well as safety cones and fences. The detectors can be quickly recharged at the jobsite. The HDE LOOKOUT mobile app works in conjunction with the LOOKOUT detectors. Using the app, an operator can remotely turn on and turn off detectors, adjust system voltage, check battery levels, receive real-time notifications and perform a number of other operational tasks. If you are interested in learning more about the LOOKOUT Voltage Detection Network, please visit http://hdelookout.com or contact your Gresco Representative.